1. This contract is subject to materials & labour being available when required. 2. All render, roughcasting and stone repairs carried out, all colours will be matched on site. These are based on our opinion and experience. We cannot be held responsible for new to old differences in colour caused by age and weathering or when trying to match original stone or render, stone samples will be used were possible to achieve the best match unless colours are specified by client direct. 3. Samples, if submitted to approval, to be accepted showing substance & general character only. Equality of bulk in colour, size or shape cannot be guaranteed. 4. All materials delivered to the site by us, or to our order are to remain our property until fixed by our staff on our instructions or until paid for. 5. We will do our best to make property watertight but cannot be held responsible for any damage due to water ingress during any works unless caused by our negligence. 6. If any TV aerials are in the way they will be removed by us but the client will need to arrange re-fitting at their own costs. If Sky dishes/TV aerials and cables or electricity cables or similar or lighting wires and units are left in position and we are trying to carefully work around them, no damage responsibility will be taken by ourselves unless caused by our negligence. If the client has any doubts, please remove before work commences. 7. The company shall not be responsible for damages to ceilings, walls, gutters or flues or building fabric, if such items are found to be defective before or during commencement of work or where damage is caused by unavoidable vibration or movement. 8. This estimate does not include work of other crafts or trades or making good after it unless specifically mentioned overleaf or unless an item for the same is included in the bills of quantities or estimate where provided. 9. Payment shall become forthwith upon submission of our account. Where the period of the work exceeds 2 weeks, arrangements shall be made for interim stage payments. Payments not forthcoming within the 2 week period will attract an interest payment at the current bank base rate level. 10. This Estimate does not include any work to timbers and substrate materials found necessary once roofs open up unless mentioned in our estimate. 11. This estimate is open for acceptance for a period of three months from the date hereof, after which it will be subjected to confirmation or adjustment. 12. This estimate is an offer to carry out the work detailed, for the figure estimated, & does not include value added tax, which shall be payable by the customer at the appropriate rate from time to time applying. 13. No Responsibility for ponding of water on flat roofs will be taken following re-roofing works. 14. Special condition where customer is a trade customer or contractor. Where a contract is based on priced bills of quantities and measurements, the Royal Institute of Chartered Surveyors shall in accordance with the current standard method adopt these, unless specified to the contrary in the bills of quantities. Upon completion the works will be re-measured in accordance with the standard method of measurement and any price adjustments made accordingly. 15. Unless otherwise agreed in writing between the company and the customer any materials stripped by the company in re-roofing contracts shall become the company’s property. 16. This estimate is based on works being executed during normal working hours. 17. The client has a 14 day “cooling-off period” in which to exercise the right to cancel the contract, starting from the date of receipt of the “notice of right to cancel”. Any guarantee given for work does not include damage from storm conditions. 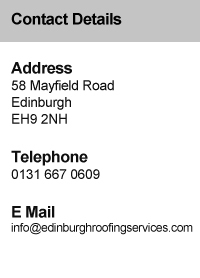 Edinburgh Roofing Services 2018. All rights reserved. Design by Outlaw Web Design.